Dear One is made from a white material with black button eyes and a larger black button nose. She holds a bouquet of white roses tied with a very pale pink ribbon. Let her know how much you care! Dear One was released on 28th February 2006. Her birthday is on 8th May 2005. 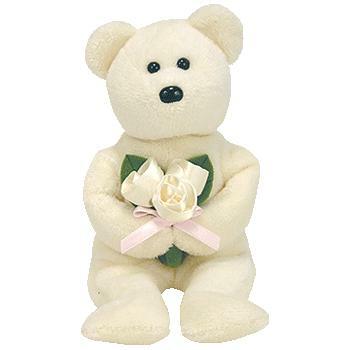 She is a Hallmark exclusive Mother’s Day bear. She retired on 25th July 2006.